I still recall, as a young girl, being obsessed with fashion design--spending long hours creating divine ensembles for beautiful girls to strut the catwalks of Paris and Milan. How I wish I'd had this beautiful book to fuel my fashionista fire! 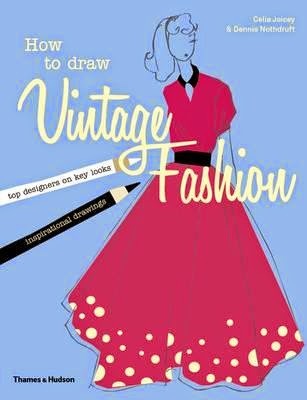 Nothing wrong with a 40-something style aficionado getting her fashion drawing on, and I'll be doing just that with this gorgeous book, featuring tips from top designers and muses, including Paul Smith and Twiggy. I'm sure younger drawers would also love to rustle up their glad rags and join me. This is a beautifully-designed book--with imagery and notes reminiscent of the sewing table of a vintage seamstress, with layer upon layer of cuttings and snippets and patterns. Tips include tools and materials, making textures and textiles shine, constructing the perfect 'croquis' (mannequin figure) and adding detail relevant to each detail from the 1920s through the 1990s, including hairstyles, shoes and bags. Fashion by decade highlights include the 1920s Flapper, 1930s Elegance and Glamour, 1940s Day Dress and Tailored Suit, 1960s Minis, 1970s Disco and Punk Princess, 1980s Pop and 1990s Grunge and Minimalist Modern. Heaven for fashion lovers. Bliss for illustrators. Perfect for kids wanting to design their own fashion career--or those who just love to draw.